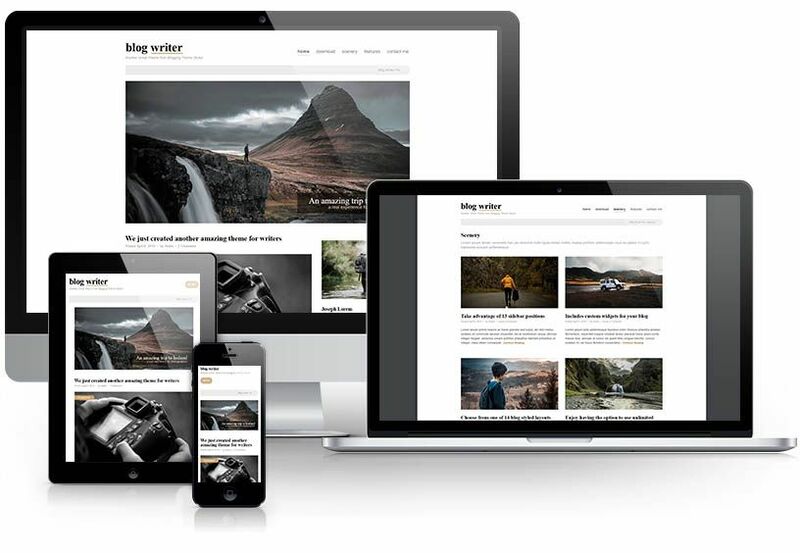 Blog Writer Pro is a clean and minimal blog theme that is built for writers who need to create a personal blog site with simplicity and subtle effects to make readers feel the pleasure of reading your articles. The design concept for Blog Writer Pro includes modern, classic, and minimal styles to give you a simple and clean blog. For bloggers, this is truly a perfect choice for you if you want to only focus on creating amazing stories. It’s super simple and easy to setup while giving you a well crafted blog right out of the box. Enjoy features like 14 blog layouts, page templates, custom widgets like the Recent Posts with thumbnails, an About Author widget, Related Posts with thumbnails, and much more! You have several purchase options available so that you can choose what works best for you. For more details, check out the PRICING page. Here are several key features of the Blog Writer Pro WordPress theme, but not limited to what it offers! Choose full width or use the boxed theme setting to choose how wide to make your boxes layouts. Choose a background colour for your pages or opt in for a beautiful page photo of your choice. Not only do you get 13 sidebar positions, but you also get dynamic width that self-adjusts. Add your personal social media page links to the special menu location we've setup for you. Showcase recent posts with our recent posts widget which includes the date and a thumbnail photo.